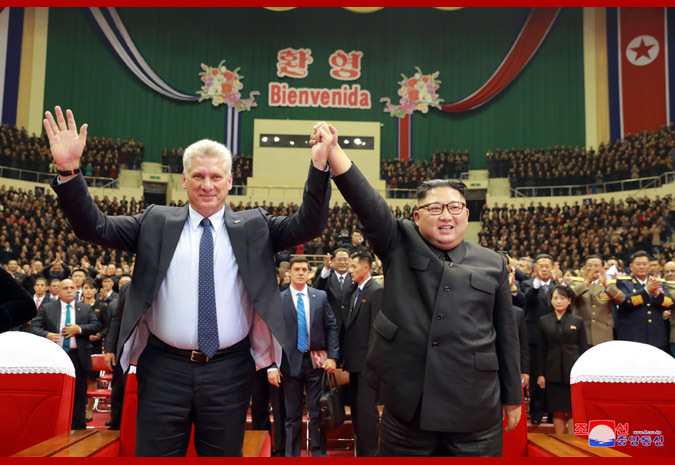 Pyongyang, November 5 (KCNA) -- A joint performance was given by major art troupes of the DPRK to welcome the DPRK visit of Miguel Mario Diaz-Canel Bermudez, president of the Council of State and president of the Council of Ministers of the Republic of Cuba, on Sunday afternoon. 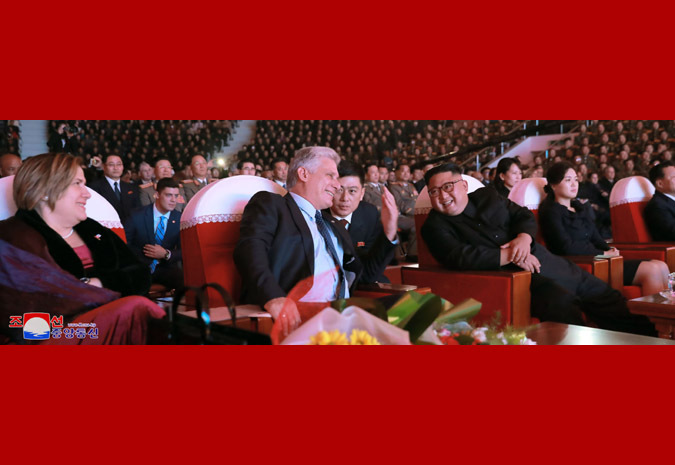 Kim Jong Un, chairman of the Workers' Party of Korea and chairman of the State Affairs Commission of the DPRK, saw the performance. Supreme Leader of the Party, state and army Kim Jong Un, together with his wife Ri Sol Ju, greeted Miguel Mario Diaz-Canel Bermudez and his wife Lis Cuesta Perasa, and exchanged warm greetings with them at the venue of the performance. The Supreme Leader, together with the Cuban president, warmly waved back to the enthusiastically cheering audience. 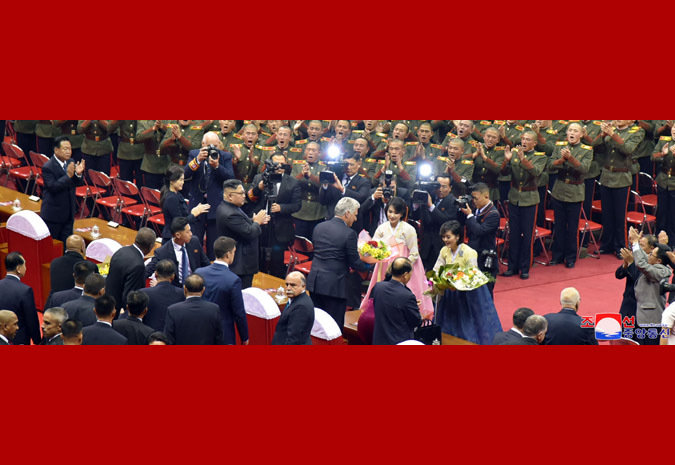 Women artistes presented bouquets to the Cuban president and his wife. 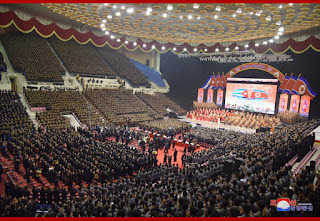 Among the audience were Choe Ryong Hae, member of the Presidium of the Political Bureau of the WPK Central Committee, vice-chairman of the State Affairs Commission of the DPRK and vice-chairman of the WPK Central Committee, Premier Pak Pong Ju, member of the Presidium of the Political Bureau of the WPK Central Committee and vice-chairman of the State Affairs Commission of the DPRK, senior party and government officials including Ri Su Yong, Pak Thae Song, Ri Yong Ho and Kim Nung O, officials of the Cabinet, ministries and national institutions, teachers and students of the Mangyongdae Revolutionary School and Kang Pan Sok Revolutionary School, working people, youths and students in Pyongyang. 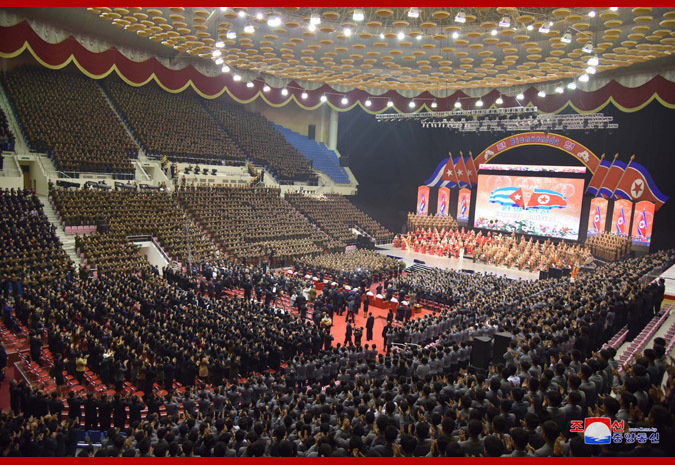 Commanding officers of the Korean People's Army including Kim Su Gil, Ri Yong Gil and No Kwang Chol and other KPA service personnel saw the performance. 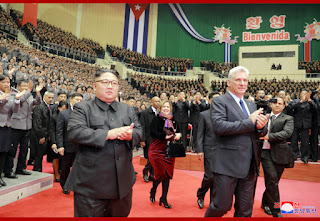 The members of the Cuban delegation and staff members of the Cuban embassy here were invited to see the performance. 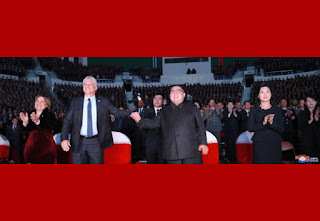 The performance was given by the artistes of the State Merited Chorus, the Samjiyon Orchestra, the Moranbong Electronic Ensemble and the Wangjaesan Art Troupe. Put on the stage to welcome the visiting Cuban friends were famous songs of the two countries including male chorus "July 26 March", female and male chorus "Only along the Road of Socialism", female chorus "Cuba under Socialism", light music "Pyongyang Is the Best", a series of songs "Guantanamera", "Glamorous Girl" and "Beautiful Cuba", and female and male chorus "Cuba si, yanqui no." 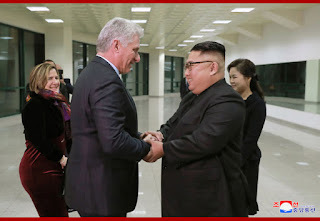 The performers vividly reflected the will of the Korean people to expand and develop the traditional friendly and cooperative relations between the two countries as required by the new era, extending firm solidarity to the Cuban people in their struggle for socialism. A floral basket in the name of the Cuban president was presented to the performers. 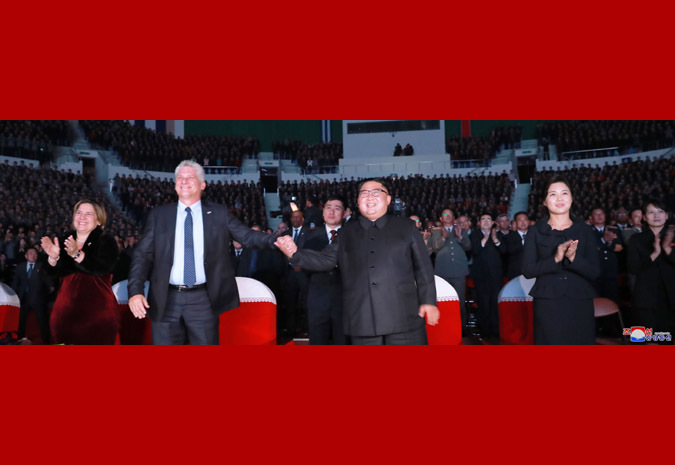 Kim Jong Un, together with the Cuban president, congratulated the performers on their successful performance.